Three Minnesota tribes are welcoming an influx of money from theAmerican Recovery and Reinvestment Act. 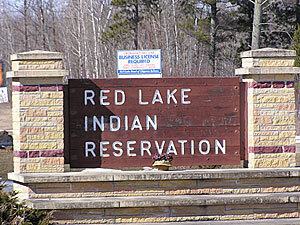 The Red Lake Nation will receive over $5 million for road, water, housing and infrastructure projects. "With the stimulus money, we should be able to get some of those done. That money is going to flow into the economy, and I think that's going to be a good shot in the arm, not only for our community, but for the area and the country," Chairman Floyd "Buck" Jourdain told Minnesota Public Radio. The White Earth Band of Ojibwe plans to build 30 new homes with stimulus funds. The tribe has applied for law enforcement, court and youth grants. The Leech Lake Band of Ojibwe will use the money to improve roads. The tribe has applied for law enforcement, education and construction grants. The Bureau of Indian Affairs is distributing $36.6 million in stimulus funds to the Midwest regional office, which includes Minnesota.